Daphne G. Fautin, Sandra L. Romano, and William A. Oliver, Jr.
Tree derived from Oliver 1996, France et al. 1996, and Chen et al. 1995. Nearly 4000 of the 6000-plus species of living anthozoans belong to the six extant orders of subclass Zoantharia (Hyman 1940), also known as Hexacorallia. The term Hexacorallia for the subclass is used widely in biology (e.g. Pearse et al. 1987, Brusca and Brusca 1990, Ruppert and Barnes 1994), although not universally (e.g. Willmer 1990, Meglitsch and Schram 1991), and morphologically corresponds to the term Octocorallia used for the other anthozoan subclass also referred to as Alcyonaria. Use of the term Hexacorallia avoids potential confusion between Zoantharia and Zoanthiniaria, a term also used for the order Zoanthidea. On the other hand, paleobiologists use the term Hexacorallia in a more restrictive sense than do biologists to refer only to Scleractinia, the order of fossil and contemporary "stony corals" with six-fold symmetry. This use of the term has a morphological counterpart in the Tetracorallia, an order of fossil corals with four-fold symmetry. Thus, there are reasons to use each term and reasons not to. We will use "Zoantharia" to refer to this subclass in the Tree of Life. Zoantharians occur in all seas, from the high intertidal to the deepest trenches, and from the poles to the equator, although some taxa occur exclusively in particular types of habitats, such as cerianthids only subtidally in soft sediments, and ptychodactiarians only at high latitudes. Although the name Hexacorallia has been used for the subclass, almost no extant members have only six tentacles or mesenteries; rather, the individual polyp of these cnidarians is typically characterized by approximately a multiple of six tentacles and mesenteries. Metamorphosis from the planula larva typically results in a polyp with six evenly-spaced mesenteries and six tentacles, one communicating with each intermesenterial space. Mesenteries and tentacles are added as the polyp grows, but the placement of new structures differs among taxa. 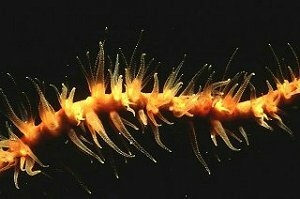 The Zoantharia is a much less cohesive group than the Alcyonaria, some of its members being skeletal and some askeletal, some being solitary and some being colonial or clonal. Antipatharia is the only exclusively colonial order of extant zoantharians; members of Actiniaria, Ceriantharia, and Corallimorpharia do not form colonies, although polyps of many corallimorpharian and actiniarian species can propagate asexually; some scleractinian species are solitary and some are colonial; zoanthids of most species occur in beds and mats, but the degree of connection between neighboring polyps varies. Figure 1. Cerianthid ("tube anemone"). Note short inner tentacles and long outer ones. Photograph copyright © 1999 George Miller. Figure 2. Colony of antipatharians ("black coral"). Photograph copyright © 1999 George Miller. 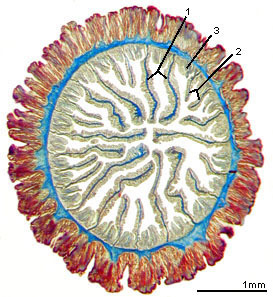 As a polyp of order Ceriantharia (Figure 1) grows, mesenteries are added in couples, one to each side of a single growth zone. Therefore, the oldest mesenteries lie diametrically opposite the youngest, which flank the growth zone. A cerianthid polyp has two circlets of tentacles - one at the margin of the oral disc and one around the mouth. Thus, for each couple of mesenteries added, four tentacles are added, two communicating with each new intermesenterial space. Some antipatharian polyps (Figure 2), being very small, have only six mesenteries and tentacles throughout life. In species in which mesenteries are added, as many as six are added, alternating with the initial six. In stony corals (Scleractinia), sea anemones (Actiniaria), and their allies, mesenteries occur in pairs. Thus, a newly-metamorphosed polyp typically has six pairs of primary mesenteries and 12 tentacles, one arising from the space between the members of each pair of mesenteries (the "endocoel") and one from the space between adjacent pairs (the "exocoel") (Figure 3). 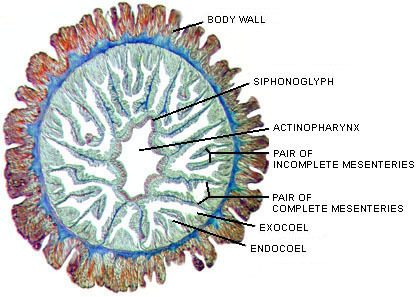 As the polyp grows, secondary mesenteries are added evenly around the circumference, a pair in each exocoel, which results in an animal with 12 pairs of mesenteries. Simultaneously, tentacles arise, communicating with the new endocoelic and exocoelic spaces. In many taxa of zoantharians, a single tentacle communicates with each exocoel and endocoel, but in some more than one tentacle communicates with each exocoel and/or endocoel. Addition of a tertiary cycle of 12 pairs of mesenteries results in a polyp with 24 pairs of mesenteries and at least 48 tentacles, etc. As the number of mesenteries and tentacles grow, irregularities inevitably arise, and development may become asynchronous so that strict hexametry is lost. Mesenteries in Zoanthidea are added in two growth zones, one on each side of one of the pairs of primary mesenteries. Hand (1966), for example, considered this to be evidence zoanthids have paired mesenteries, whereas Grasshoff (1984) considered the mesenteries to be unpaired. Figure 3. Cross-sections of a juvenile sea anemone (Megalactis sp.) with three cycles of mesenteries: at left a section at the level of the actinopharynx, at right a section nearer the base. 1 indicates primary mesenteries, of which there are six pairs; 2 indicates secondary mesenteries, of which there are six pairs; and 3 indicates tertiary mesenteries, of which there are 12 pairs. In this example, the primary mesenteries are complete (they connect to the actinopharynx, as in the left-hand image), whereas the secondary and tertiary mesenteries are incomplete (they do not connect to the actinopharynx). Polyps of some species have fewer cycles of mesenteries and some have many more, and the number of cycles of complete mesenteries varies; these are all characters of systematic importance. Two orders of living zoantharians have skeletons - the Scleractinia and the Antipatharia. The rigid scleractinian skeleton, which lies external to the polyps that make it, is composed of calcium carbonate in the crystal form aragonite (Milliman 1974). Much of the framework of coral reefs is formed by scleractinians. The antipatharian skeleton lies internal to the polyps that make it, and, being composed largely of organic material, is flexible (Goldberg 1976). 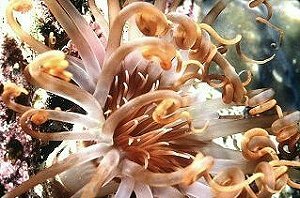 Sea anemones of one genus, Galatheanthemum, secrete an external chitinous tube; some other actiniarians, particularly those living in the deep sea, secrete chitinous material that clings to the body but that does not have the integrity of a tube. Cerianthids burrow into soft sediments, and construct a tube that incorporates mud into a feltwork of discharged cnidae of a type unique to members of that order -- the ptychocyst (Mariscal et al. 1977). Polyps belonging to Corallimorpharia do not secrete a skeleton or tube of any kind. Although zoanthids do not produce a skeleton either, they incorporate into the mesoglea of their body walls exogenous material such as sand grains and sponge spicules. The skeleton of an individual scleractinian polyp is known as a corallite. Each of its radially-aligned elements, termed septa, lies in the endocoel flanked by the members of a mesenterial pair. Septa are secreted by the mesenteries and are therefore added in the same order as the mesenteries. As a result, septa of different ages are adjacent to one another, and the symmetry of the scleractinian skeleton is radial or biradial. This pattern of septal insertion is termed „cyclic‰ by paleontologists (Figure 4 right). By contrast, in some fossil corals, adjacent septa lie in order of increasing age, a pattern that is termed serial (Figure 4 left) and that produces a bilateral symmetry. Figure 4. Septal arrangements in anthozoan corals: left, serial; right, cyclic. Serial and cyclic insertion of septa are fundamentally different. Modified from Oliver (1996). Copyright © 1996 The Paleontological Society. The eight extinct orders of zoantharians (Oliver 1996) are known almost exclusively from their fossil skeletons, all of which were calcitic except those of Kilbuchophyllida and Numidiaphyllida, which were probably aragonitic (Scrutton 1997). Corallites of order Tabulata (Early Ordovician [500 mya] to Late Permian [250 mya]) have poorly developed septa and slender corallites crossed by many tabulae (horizontal skeletal elements between septa). Larger tabulates were relatively important in Paleozoic reefs but were not really frame-builders as they had no proper means of attachment (Clarkson 1986); smaller tabulates lived in deeper and colder waters (Hill and Stumm 1956; Clarkson 1986). The Rugosa (Middle Ordovician to Late Permian) consists of corals in which septa were inserted serially (Figure 4). Once they evolved, they spread throughout the oceans relatively quickly (Hill and Stumm 1956). It is thought that solitary rugosans preferred soft substrates, having had no effective means of anchorage on the sea floor; colonial rugosans did not normally fix themselves to the sea floor, either, and so were seldom frame-builders of Paleozoic reefs but were found both in and near reef habitats (Clarkson 1986). Rugose corals are thought to have been very sensitive to environmental conditions (Clarkson 1986). Kilbuchophyllida (Middle Ordovician [470 mya]) consists of corals that show hexameral, cyclic septal insertion (Scrutton and Clarkson 1991). Members of order Heterocorallia (Late Devonian [370 mya] to Early Carboniferous [350 mya]) possess four axially joined protosepta that subsequently divide to form a Y in cross section, and also have tabulae. They may have lived pseudo-planktonically, attached to seaweeds (Hill 1956). Those comprising order Cothoniida (Middle Cambrian [540 mya]) have an operculum and weak septa. Corals belonging to order Tabulaconida (Early Cambrian [570 mya]) are cerioid (having corallites with shared walls) or fasciculate (having corallites that are separate from one another). The order Heliolitida (Middle Ordovician to Middle Devonian [380 mya]) consists of corallites separated by extensive coenosteum (skeletal elements between corallites). Knowledge of soft tissue and functional morphology of extinct skeletalized taxa is entirely by inference. It is assumed that the soft tissues of extinct skeletalized taxa bore a structural and functional relationship to the skeleton similar to that in contemporary forms. Mesenteries of rugosan corals were inserted serially, with four new septa presumably arising simultaneously, one in each the four quadrants of the polyp defined by the primary septa. Each developed adjacent to the youngest septum in the quadrant. Patterns of septal insertion are used to infer phylogenetic relationships (see below). Although there is some fossil evidence of soft-bodied zoantharians (e.g. Arai and McGugan 1968; Boyd 1974), knowledge of now-extinct non-skeletalized zoantharians is likely to remain sparse. Soft-tissue morphology defines two clear groups of these zoantharians. Those in which mesenteries occur singly are Antipatharia and Ceriantharia, but these taxa are not necessarily one another's nearest relatives (see discussion below). The others, in which the mesenteries occur in pairs (although Grasshoff  considered Zoanthidea to have unpaired mesenteries), presumably constitute a lineage. Hand (1966) puzzled over the significance of mesenterial pairing. Clearly, a polyp does not need paired mesenteries to exist or even to attain considerable size (some cerianthids reportedly attain a length of 35 cm [Hyman 1940] and, therefore, presumably reach an oral disc diameter of perhaps 10 cm). Hand (1966) hypothesized the functional signficance of paired mesenteries is to allow symmetrical contraction of the polyp over the rigid and potentially sharp septum of a corallite to flush the space between mesentery and septum. Paired mesenteries serve no function in corallimorpharians, actiniarians, and zoanthids, he hypothesized, but indicate their scleractinian ancestry. Of the nine orders of zoantharians with an exoskeleton, only Scleractinia still exists. Because they have a relatively good fossil record, relationships within and among these taxa have been extensively studied by paleontologists. As a result, coral taxonomy and systematics have been primarily the province of paleontology, which has led to systematic and evolutionary hypotheses being based on characteristics of the skeleton. Hypotheses about relationships among non-skeletalized groups are based largely on comparisons of polyp morphology. Molecular methods are now being used to study relationships among skeletalized and non-skeletalized extant taxa. 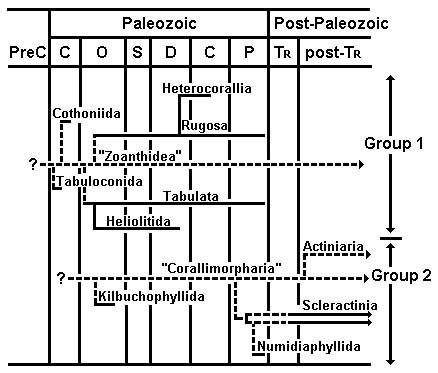 Oliver (1996) proposed two major lineages in the Zoantharia based on comparative morphology (for detailed discussions, see also Scrutton 1997, and included references) as well as stratigraphic position (Figure 5). The Group 1 lineage consists of six extinct orders and possibly the extant order Zoanthidea. The Group 2 lineage consists of two extinct orders and three extant ones. Oliver (1996) did not consider the extant orders Ceriantharia and Antipatharia. Figure 5. Proposed phylogeny of fossil zoantharians and some contemporary taxa. The terms "Zoanthidea" and "Corallimorpharia" are used for hypothesized non-skeletalized stem-polyps. Horizontal lines represent stratigraphic ranges: solid lines are based on fossil evidence, dashed lines are inferred. Vertical lines represent evolutionary connections: solid lines are based on fossil evidence, dashed lines are inferred from other sorts of data. Adapted from Oliver (1996); copyright © 1996 The Paleontological Society. In the Group 1 lineage, the Tabulaconida and Cothoniida are hypothesized to be early skeletalizing "experiments" in one or more groups of non-skeletalized zoantharians. These non-skeletalized ancestors are commonly referred to as "anemones" in the paleontologic literature (e.g. Oliver 1996); such usage is to be discouraged because it may lead, consciously or not, to the conclusion that the ancestral animal was identical to modern members of order Actiniaria. The soft-bodied ancestor(s) of Group 1 animals had serially inserted mesenteries. This non-skeletalized stock, which gave rise to the Rugosa during the Ordovician, could also have been ancestral to the Heterocorallia, although direct evolution of the Heterocorallia from the Rugosa seems more likely. Similarities of the problematic Tabulata to the Rugosa suggest that tabulates may have been derived earlier from the same non-skeletalized ancestral taxon as the Rugosa. The Heliolitida most likely had a tabulate ancestor. The Group 1 lineage may have become extinct, possibly in the Paleozoic, along with the Rugosa and Tabulata, or it may be represented by the living Zoanthidea, which have (to paraphrase Hyman 1940, page 623) a mesenterial arrangement unlike that of any other living anthozoan but somewhat like one that presumably would have produced the serial septal insertion pattern of the Rugosa (see Scrutton 1997 for more detailed discussion). Oliver (1996) proposed that the Group 2 orders evolved from a non-skeletalized ancestor with cyclic insertion of mesenteries. Discussion of relationships among Group 2 orders centers around two matters: 1) the origin of Scleractinia, and 2) whether Scleractinia is the most derived or the most ancestral of the three living orders in Oliver's (1996) scheme. There are two main hypotheses about the origin of Scleractinia. The closest scleractinian analog in the Paleozoic is the Rugosa, which suggests direct, possibly polyphyletic, descent, with different scleractinian suborders having originated in different rugosan families (Schindewolf 1942; Cuif 1977). Schindewolf (1942) interpreted septal patterns in some Permian corals as representing intermediates between serial and cyclic septal insertion. Cuif's (1977) hypothesis for a monophyletic origin of Scleractinia and Rugosa largely resulted from his microstructural analyses of scleractinian and rugosan skeletons. He argued that ontogenesis of septal formation in both groups provides no evidence that they were distinct and independent. He presented evidence that some Paleozoic corals were originally aragonitic, their calcitic state as fossils being due to recrystallization of the calcium carbonate. This hypothesis has largely been eclipsed by the second, which suggests the similarities of scleractinians to rugosans are due to a common non-skeletalized ancestor in the early Paleozoic (Scrutton 1997). Three lines of evidence against direct descent of Scleractinia from Rugosa were detailed by Oliver (1980; 1996 and included references). The strongest line is that rugosan septal insertion is serial and bilateral for both major and minor septa, whereas scleractinian insertion is cyclic and either bilateral or radial (Figure 2). The second line of evidence is that rugosan skeletons were composed of calcite; scleractinian skeletons are, and apparently always have been, composed of aragonite. The third is that the most recent rugosans lived in latest Permian times whereas the earliest scleractinians appeared in the Middle Triassic. Recently discovered Paleozoic corals with aragonitic skeletons and cyclic septal insertion - two features that characterize Scleractinia - have strengthened the hypothesis for an independent origin of the Scleractinia. Kilbuchophyllida is thought to represent an early, ultimately unsuccessful experiment in skeletalization by a group of non-skeletalized anthozoans that later gave rise to Scleractinia (Scrutton and Clarkson 1991). Likewise, Numidiaphyllum from the Upper Permian of Tunisia has been described as aragonitic (Wendt 1990) with cyclic septal insertion (Ezaki 1997). Molecular analyses are beginning to contribute data to the debate on the origin of the Scleractinia. A study of scleractinian relationships based on sequences of mitochondrial DNA (mtDNA) (Romano and Palumbi 1996) supports the hypothesis that a scleractinian-like skeleton originated more than once. These data suggest that two major lineages of Scleractinia diverged from each other before the first appearance of the scleractinian skeleton in the fossil record, a conclusion that is consistent with data from fossils (e.g. Wells 1956). However, the two lineages defined by molecular and fossil data are not entirely coincident. Also unresolved is the issue of whether only the skeleton of Scleractinia is polyphyletic or whether the taxon itself is. In the debate on the origin of Scleractinia, the preponderance of evidence supports an origin independent of the Rugosa (e.g. Ezaki 1998). This conclusion bears on discussions of the relationships among Scleractinia, Corallimorpharia, and Actiniaria, and has been interpreted as support for the hypothesis that scleractinians are derived from corallimorpharians or actiniarians. Wells and Hill (1956) classified these three groups as suborders in order Hexactiniaria, with Scleractinia being more closely related to Actiniaria than to Corallimorpharia based on the relationship of tentacles to mesenteries. Oliver (1996) hypothesized the Scleractinia evolved from a group of non-skeletalized zoantharians similar to the Corallimorpharia. Some molecular analyses lend support to the hypothesis that Scleractinia is derived from Corallimorpharia or Actiniaria. In an analysis of anthozoan relationships based on sequences of the nuclear ribosomal 28S gene (Chen et al. 1995), Scleractinia forms a monophyletic group that is derived in relation to Corallimorpharia and Actiniaria. Moreover, in this analysis neither Actiniaria nor Corallimorpharia is monophyletic - some representatives of each order are more closely related to representatives of the other order than to representatives of the same order (Figure 6). Figure 6. Phylogeny derived from 28S ribosomal RNA sequences (from Chen et al. 1995). An alternative hypothesis for the relationship of Scleractinia to the extant, non-skeletalized zoantharians is that the soft-bodied groups are derived from scleractinians by the loss of the skeleton. Data that support this hypothesis are from soft-tissue morphology and molecular analyses. Polyps of Corallimorpharia are virtually identical to those of Scleractinia morphologically; they differ mainly in corallimorpharians lacking skeletons. Hand (1966) interpreted these similarities (including of cnidom [types of cnidae]) as indicating more recent descent of Corallimorpharia from its scleractinian ancestor than of Actiniaria and Zoanthidea. Using radioimmunoassay of whole animals representing four orders of Zoantharia, Fautin and Lowenstein (1993) and Buddemeier and Fautin (1996) also concluded that Scleractinia is ancestral to Actiniaria and Corallimorpharia, and that those three taxa form a monophyletic group relative to Ceriantharia. In the more comprehensive analysis (Buddemeier and Fautin 1996), one scleractinian is more closely related to the three corallimorpharians than to the four other scleractinians, and Actiniaria forms a monophyletic group (Figure 7). A rate of change in immunological distance was calculated based on the well-established divergence time from the fossil record of two scleractinian genera included in the analysis. This rate was then used to determine divergence times among other taxa in the analysis. This estimate is believed to be reasonably accurate even though it will underestimate the time of divergence for higher taxa because the proportionality between immunological distance and time diminishes with time (Lowenstein 1981). Buddemeier and Fautin (1996) estimated from this analysis that actiniarian and scleractinian/corallimorpharian lineages diverged 75 mya, and the corallimorpharian lineage diverged from the scleractinian lineage 55 mya. Since the scleractinian fossil record goes back 240 my, these immunological data support the hypothesis that Scleractinia is ancestral to both Actiniaria and Corallimorpharia. The greater morphological similarity of corallimorpharians to scleractinians than of actiniarians to scleractinians is consistent with the hypothesis that corallimorpharians were derived more recently from scleractinians than were actiniarians. Figure 7. Phylogeny derived from radioimmunoassay data (from Buddemeier and Fautin 1996). Two mechanisms have been proposed for the evolution of non-skeletalized zoantharians from scleractinians: a polyp may leave its skeleton, or it may not produce one (Fautin and Lowenstein 1993). Scleractinian polyps can abandon their skeletons (Goreau and Goreau 1959, Sammarco 1982, Kramarsky-Winter et al. 1997). Carbonate saturation state of the ocean may affect a coral's ability to form skeletons (Smith and Buddemeier 1992, Gattuso et al. 1999); lowered saturation states correlate with the periods during which non-skeletalized zoantharians are inferred to have arisen based on immunological data (Buddemeier and Fautin 1996). It is possible that some of the apparent gaps in the fossil record of particular scleractinian lineages are due to there having been times when the corals ceased forming skeletons altogether, or formed fragile ones that were not preserved, and then, when circumstances changed, resumed precipitating more massive skeletons (see Veron 1995). Analysis of sequences of the mitochondrial ribosomal 16S gene also provides some support for the hypothesis that Scleractinia is more closely related to Corallimorpharia than either is to Actiniaria. In a study of anthozoan relationships involving 29 species in five orders, France et al. (1996) found Actiniaria to be monophyletic while Corallimorpharia and Scleractinia together form a monophyletic group (Figure 8). One representative of Scleractinia is more closely related to the one representative of Corallimorpharia in the analysis than to the other representative of Scleractinia. Berntson et al. (1999) analyzed complete nuclear ribosomal 18S sequences from all orders of anthozoans. This most complete of the molecular datasets available, in terms of number of characters and taxon sampling, also supports the hypothesis that Corallimorpharia is more closely related to Scleractinia than to Actiniaria. Scleractinia and Actiniaria is each monophyletic; Corallimorpharia is not monophyletic and, although it is most closely related to Scleractinia, its relative placement - basal to or within Scleractinia -- is unresolved. Figure 8. Phylogeny derived from 16S ribosomal RNA sequences (from France et al. 1996). The hypotheses that Corallimorpharia and Scleractinia are more closely related to each other than either is to Actiniaria (e.g. Hand 1966, Schmidt 1974, Fautin and Lowenstein 1993, France et al. 1996), and that Corallimorpharia does not constitute an order separate from Scleractinia are hardly novel. In 1898, Duerden invoked several earlier anemone specialists in arguing that corallimorpharians are merely skeletonless scleractinians. Moreover, he found his study "as suggestive of an ancestry in which a skeleton was present..." (page 640), although he acknowledged late in the paper that the reverse might have been the case. Stephenson (1921) concluded "There has been a growing feeling among those who have worked at anemones that there is a good deal of inter-relation between them and the corals, and that we can no longer insist on a separation of them based on presence or absence of a skeleton alone." He went on to suggest that corallimorpharians be put into Madreporaria (a name then used for Scleractinia). Clearly, Scleractinia ultimately evolved from some soft-bodied anthozoan, but this need not have been a member of a currently-extant order. Moreover, if paired mesenteries were a preadaptation to the deposition of a calcareous skeleton, it is unclear which of the several non-skeletalized groups with paired mesenteries should be considered ancestral, and why the trait should have arisen. In summary, the available data support the hypothesis that Corallimorpharia, Actiniaria, and Scleractinia are very closely related to each other, but which two are more closely related and what the ancestor-descendant relationship is remain equivocal. The three groups seem to have been derived from a single lineage of non-skeletalized zoantharians, and skeletalization appears to have evolved in this lineage more than once. Perhaps more molecular data or data of higher resolution will resolve the relationships among these taxa. The relationship of Ceriantharia and Antipatharia to other orders of extant Zoantharia has also been a subject of debate. Analyses of nematocysts (Schmidt 1974) and molecules (France et al. 1996, Song and Won 1997, Berntson et al. 1999) support the hypothesis that Ceriantharia and Antipatharia are not one another's nearest relatives, and therefore do not constitute a subclass of their own separate from the Zoantharia. Data collected by Schmidt (1974), France et al. (1996), and Berntson et al. (1999) support the hypothesis that Ceriantharia is the most basal group of Zoantharia. Analyses of nuclear ribosomal sequences (Song et al. 1994, Chen et al. 1995, Song and Won 1997) place Ceriantharia basal to both Zoantharia and Alcyonaria, whereas an analysis of mitochondrial sequences (France et al. 1996) places Ceriantharia in a monophyletic group with other zoantharian orders. Analysis of nuclear 18S ribosomal sequences by Berntson et al. (1999) also supports a basal position of Ceriantharia within Zoantharia but does not establish its position within Anthozoa with statistical certainty: Ceriantharia is equally likely to be related to any anthozoan order, but it may merit subclass status. As for all analyses, some conflicting results may be due to problems of taxon sampling - few analyses include representatives of all orders and/or many lack more than one representative of some of the orders sampled. Morphological and molecular data support a sister relationship between Antipatharia and Zoanthidea. Schmidt (1974) proposed this hypothesis based on nematocysts. France et al. (1996) found Antipatharia and Actiniaria to be sister groups using mitochondrial sequence data, but they included no zoanthideans in the analysis. However, analyses by Berntson et al. (1999), which included representatives of all orders of Zoantharia, not only establish the affinity of Antipatharia to Zoantharia, but support the hypothesis that Antipatharia is most closely related to Zoanthidea. Molecular (Berntson et al. 1999) and morphological (Cappola and Fautin 2001) data have resolved the status of Ptychodactiaria, a taxon consisting of three species of high-latitude soft-bodied zoantharians that had been considered to be an order (Carlgren 1949). The molecular analysis (Berntson et al. 1999) places the group within Actiniaria. The morphological features used to distinguish the two taxa do not do so: some features are found in both Ptychodactiaria and Actiniaria, and others do not actually exist, so Cappola and Fautin (2001) considered Ptychodactiaria to be a suborder of abasilar actiniarians. Arai, M. N. and A. McGugan. 1968. A problematical coelenterate(?) from the Lower Cambrian, near Moraine Lake, Banff area, Alberta. Journal of Paleontology 42:205-209. Bayer, F. M. 1956. Octocorallia. Pages F166-F230 in: R. C. Moore (ed. ), Treatise on Invertebrate Paleontology Part F: Coelenterata. Geological Society of America and University of Kansas Press, Lawrence. Bayer, F. M., M. Grasshoff, and J. Verseveldt. 1983. Illustrated trilingual glossary of morphological and anatomical terms applied to Octocorallia. E. J. Brill / Dr. W. Backhuys, Leiden. 75 pages. Boyd, D. W. 1974. Wyoming specimens of the trace fossil Bergaueria. Contributions to Geology 13:11-15. Bridge, D., C. W. Cunningham, R. deSalle, and L. W. Buss. 1995. Class-level relationships in the phylum Cnidaria: molecular and morphological evidence. Molecular Biology and Evolution 12:679-689. Brusca, R. C. and G. J. Brusca. 1990. Invertebrates. Sinauer Associates, Inc. Sunderland, Massachusetts. 922 pages. Buddemeier, R. W. and D. G. Fautin. 1996. Global CO2 and evolution among the Scleractinia. Pages 33-38 in Biomineralization 93 (Proceedings of the 7th International Symposium on Biomineralization), Museé Oceanographiqué Monaco. Cairns, S. D. 1999. Species richness of Recent Scleractinia. Atoll Research Bulletin No. 459. 46 pp. Cappola, V. A. and D. G. Fautin. 2001. All three species of Ptychodactiaria belong to order Actiniaria (Cnidaria: Anthozoa). Journal of the Marine Biological Association in press. Carlgren, O. 1949. A Survey of the Ptychodactiaria, Corallimorpharia and Actiniaria. Kungl. Svenska Vetenskapsakadamiens Handlingar, Series 4, Volume 1 (1):1-121. Chen, C. A., D. M. Odorico, M. ten Lohuis, J. E. N. Veron, and D. J. Miller. 1995. Systematic relationships within the Anthozoa (Cnidaria: Anthozoa) using the 5'-end of the 28S rDNA. Molecular Phylogeny and Evolution 4:175-183. Clarkson, E. N. K. 1986. Invertebrate Paleontology and Evolution. Allen and Unwin, London. 382 pages. Cuif, J.-P. 1977. Arguments pour une relation phyletiqué entre les madreporairés Paléozoiqueé et ceux du trias. Memoirés de la Societe Geologiqué de France, n.s. 129:1-54. Duerden, J. E. 1898. On the relations of certain Stichodactylinae to the Madreporaria. Journal of the Linnaean Society of Zoology 26:635-653. Dunn, D. F. 1981. The clownfish sea anemones: Stichodactylidae (Coelenterata: Actiniaria) and other sea anemones symbiotic with pomacentrid fishes. Transactions of the American Philosophical Society 71(1):1-115. Dunn, D. F. 1982. Cnidaria. Pages 669-706 in S. P. Parker (ed. ), Synopsis and Classification of Living Organisms, Volume 1. McGraw-Hill Book Company, New York and other cities. Ezaki, Y. 1997. The Permian coral Numidiaphyllum: new insights into anthozoan phylogeny and Triassic scleractinian origins. Palaeontology 40:1-14. Ezaki, Y. 1998. Paleozoic Scleractinia: progenitors or extinct experiments? Palaeobiology 24:227-234. Fautin, D. G. and J. M. Lowenstein. 1993. Phylogenetic relationships among scleractinians, actinians, and corallimorpharians (Coelenterata: Anthozoa). Proceedings of the 7th International Coral Reef Symposium 2:665-670. Fautin, D. G. and R. N. Mariscal. 1991. Cnidaria: Anthozoa. Pages 267-358 in F. W. Harrison and J. A. Westfall (eds. ), Microscopic Anatomy of Invertebrates, volume 2: Placozoa, Porifera, Cnidaria, and Ctenophora. Wiley-Liss, Inc., New York and other cities. Fautin, D. G., J. G. Spaulding, and F.-S. Chia. 1989. Cnidaria. Pages 43-62 in K. G. Adiyodi and R. G. Adiyodi (eds. ), Reproductive Biology of Invertebrates, volume 4, part A (Fertilization, Development, and Parental Care). Oxford and IBH Publ. Co., New Delhi. France, S. C., P. E. Rosel, J. E. Agenbroad, L. S. Mullineaux, and T. D. Kocher. 1996. DNA sequence variation of mitochondrial large-subunit rRNA provides support for a two subclass organization of the Anthozoa (Cnidaria). Molecular Marine Biology and Biotechnology 5:15-28. Gattuso, J.-P., D. Allemand, and M. Frankignoulle. 1999. Photosynthesis and calcification at cellular, organismal and community levels in coral reefs: a review on interactions and control by carbonate chemistry. American Zoologist 39(1):160-183. Goldberg, W. M. 1976. Comparative study of the chemistry and structure of gorgonian and antipatharian coral skeletons. Marine Biology 35:253-267. Goreau, T. F. and N. I. Goreau. 1959. The physiology of skeleton formation in corals. II. Calcium deposition by hermatypic corals under various conditions in the reef. Biological Bulletin 117:239-250. Grasshoff, M. 1984. Cnidarian phylogeny - a biomechanical approach. Palaeontographica Americana 54:127-135. Hill, D. 1956. Heterocorallia. Pages F324-F327 in: R. C. Moore (ed. ), Treatise on Invertebrate Paleontology: Part F: Coelenterata. Geological Society of America and University of Kansas Press, Lawrence. Hill, D. and E. C. Stumm. 1956. Tabulata. Pages F444-F477 in: R. C. Moore (ed. ), Treatise on Invertebrate Paleontology: Part F: Coelenterata. Geological Society of America and University of Kansas Press, Lawrence. Hyman, L. 1940. The Invertebrates. McGraw-Hill, New York. 726 pages. Hyman, L. H. 1956. Morphology of living coelenterates. Pages F10-F20 in: R. C. Moore (ed. ), Treatise on Invertebrate Paleontology: Part F: Coelenterata. Geological Society of America and University of Kansas Press, Lawrence. Kramarsky-Winter, E., M. Fine, and Y. Loya. 1997. Coral polyp expulsion. Nature 387:137. Lowenstein, J. M. 1981. Immunological reactions from fossil material. Philosophical Transactions of Royal Society, London 292B:143-149. Mariscal, R. N., E. J. Conklin, and C. H. Bigger. 1977. The ptychocyst, a major new category of cnida used in tube construction by a cerianthid anemone. Biological Bulletin 152:392-405. Meglitsch, P. A. and F. R. Schram. 1991. Invertebrate Zoology, third edition. Oxford University Press, Oxford and other cities. 623 pages. Milliman, J. D. 1974. Marine Carbonates. Springer-Verlag, Berlin and other cities. 373 pages. Oliver, W. A., Jr. 1980. The relationship of the scleractinian corals to the rugose corals. Paleobiology 6:146-160. Oliver, W. A., Jr. 1996. Origins and relationships of Paleozoic coral groups and the origin of the Scleractinia. Pages 107-134 in G. D. J. Stanley (ed. ), Paleobiology and Biology of Corals. The Paleontological Society, Columbus, Ohio. Oliver, W. A., Jr. and A. G. Coates. 1987. Phylum Cnidaria. Pages 140-193 in R. S. Boardman, A.H. Cheetham, and A. J. Rowell (eds. ), Fossil Invertebrates. Blackwell Scientific Publications, Palo Alto, California. Pearse, V., J. Pearse, M. Buchsbaum, and R. Buchsbaum. 1987. Living Invertebrates. Blackwell Scientific Publications, Palo Alto, California. 848 pages. Romano, S. L. and S. R. Palumbi. 1996. Evolution of scleractinian corals inferred from molecular systematics. Science 271:640-642. Romano, S. L. and S. R. Palumbi. 1997. Molecular evolution of a portion of the mitochondrial 16S ribosomal gene region in scleractinian corals. Journal of Molecular Evolution 45:397-411. Ruppert, E. E. and R. D. Barnes. 1994. Invertebrate Zoology, sixth edition. Saunders College Publishing, Fort Worth and other cities. 1056 pages. Sammarco, P. W. 1982. Polyp bail-out: an escape response to environmental stress and a new means of reproduction in corals. Marine Ecology Progress Series 10:57-65. Schindewolf, O. H. 1942. Zur Kenntnis der Polycoelien und Plerophyllen. Eine Studie ueber den Bau der "Tetrakorallen" und ihre Beziehungen zu den Madreporarien. Abhandlungen des Reichsamts fuer Bodenforschung, n.f. 204:1-324. Schmidt, H. 1974. On evolution in the Anthozoa. Proceedings of the 2nd International Coral Reef Symposium 1:533-560. Schuchert, P. 1993. Phylogenetic analysis of the Cnidaria. Zeitschrift fuer zoologische Systematik und Evolutionsforschung 31:161-173. Scrutton, C. T. 1997. The Paleozoic Corals, I: origins and relationships. Proceedings of the Yorkshire Geological Society 51(3):177-208. Scrutton, C. T. and E. N. K. Clarkson. 1991. A new scleractinian-like coral from the Ordovician of the southern uplands, Scotland. Palaeontology 34:179-194. Shick, J. M. 1991. 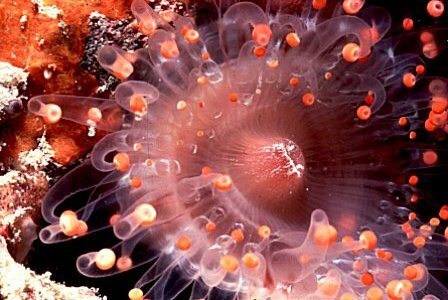 A Functional Biology of Sea Anemones. Chapman and Hall, London and other cities. 395 pages. Smith, S. V. and R. W. Buddemeier. 1992. Global change and coral reef ecosystems. Annual Review of Ecology and Systematics 23:89-118. Song, J.-I., W. Kim, W.K. Kim, and J. Kim. 1994. Molecular phylogeny of anthozoans (phylum Cnidaria) based on the nucleotide sequences of 18s rRNA gene. Korean Journal of Zoology 37:343-351. Song, J.-I. and J. H. Won. 1997. Systematic relationship of the anthozoan orders based on the partial Nuclear 18s rDNA sequences. Korean Journal of Biological Sciences 1:43-52. Stephenson, T. A. 1921. On the classification of Actiniaria. Part II.-Consideration of the whole group and its relationships, with special reference to forms not treated in Part I. Quarterly Journal of Microscopical Science, n.s. 65(260):493-576. Tixier-Durivault, A. 1987. Sous-classe des Octocoralliaires. Pages 3-185 in D. Doumenc (ed. ), Traité de zoologie: anatomie, systematique, biologie, Volume 3 (Cnidaires, Anthozoaires). Masson, Paris and other cities. Veron, J. E. N. 1995. Corals in Space and Time: The Biogeography and Evolution of the Scleractinia. University of New South Wales Press, Sydney. 321 pages. Wedi, S. E. and D. F. Dunn. 1983. Gametogenesis and reproductive periodicity of the subtidal sea anemone Urticina lofotensis (Coelenterata: Actiniaria) in California. Biological Bulletin 165:458-472. Wells, J. W. 1956. Scleractinia. Pages F328-F440 in: R. C. Moore (ed. ), Treatise on Invertebrate Paleontology: Part F: Coelenterata. Geological Society of America and University of Kansas Press, Lawrence. Wells, J. W. and D. Hill. 1956. Anthozoa - general features. Pages F161-F165 in: R. C. Moore (ed. ), Treatise on Invertebrate Paleontology: Part F: Coelenterata. Geological Society of America and University of Kansas Press, Lawrence. Wendt, J. 1990. The first aragonitic rugose coral. Journal of Paleontology 64:335-340. Willmer, P. 1990. Invertebrate Relationships: Patterns in Animal Evolution. Cambridge University Press, Cambridge and other cities. 400 pages.